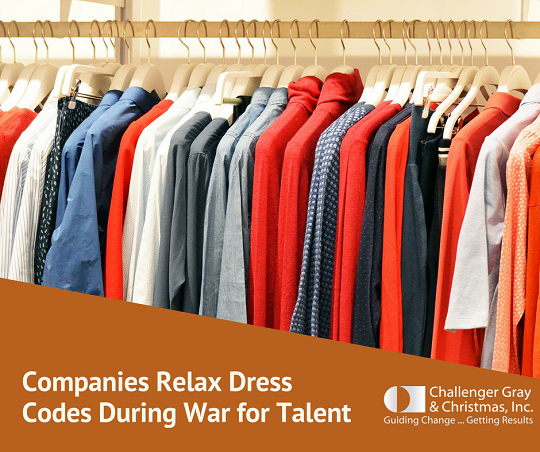 Companies Allow Dressing Down as War for Talent Heats Up | Challenger, Gray & Christmas, Inc.
Tattoos, once taboo in the workplace, are now commonplace in many offices, as employers found that to keep or attract talent, they needed to overlook this kind of body art. Now, companies may be considering relaxing dress codes, especially in a tight labor market, according to one workplace authority. “For years, companies required stringent dress codes for both men and women due to cultural expectations. A well-dressed workforce was considered key to running a respectable business. But with the start-up culture and the work-from-home trend, some companies have started to relax the rules,” said Andrew Challenger, Vice President of global outplacement and executive coaching firm Challenger, Gray & Christmas, Inc. Relaxed dress at work was inspired by Silicon Valley dot.com boom that began in the1980s. The long work hours and nature of the tech world caused companies to reject norms and wear more comfortable dress. “This was, in part, an effort to attract young tech talent, and companies in other industries realized it was a good way to recruit within their own industries. By the mid-1990s, almost three quarters of companies instituted some kind of casual dress day, according to a 1996 article from Bloomberg,” added Challenger. In 2016, JPMorgan Chase made waves when the company decided to allow business casual dress every day, showing a significant shift for the banking giant. More recently, Walmart said employees in some stores could wear blue jeans to work. Though not allowed in all stores yet, if the company sees improvement in productivity and morale, it could go into effect everywhere. “There are some definite positives to shifting to a more casual dress code for companies. Employees will feel like you trust them, which will likely lead to greater job satisfaction and retention,” said Challenger. “But, as with all changes, clear communication of expectations is key. Specifically, employees may be confused as to exactly what is considered appropriate, especially without good guidelines,” he added. In fact, managers at GM worried about this when Mary Barra switched the GM dress code to just two words, “dress appropriately.” Barra, who worked at all levels of the organization, believed in addressing seemingly small policies to build a better corporate culture. One of her first tasks when she became head of human resources in 2009 was to tackle the dress code. “Especially during a restructuring or other time of change, reviewing a seemingly small policy can have a significant positive impact to employee morale and job satisfaction,” said Challenger. “For workers, the bottom line is to dress in a way that conveys respect for the workplace and your position. This will look different at every company, but you want to show the best version of yourself at work. Not only will this impress co-workers, customers, or clients, but it will show higher-ups that you value your work and may signal to them it’s time for you to advance,” said Challenger. Dress the part: Dress as if you will meet with your CEO every day. While office culture dictates whether you dress casually or more formally, you should always be in well-fitting, clean clothing, appropriate for your position and duties. Play Copycat: If you are unsure how you should dress at work, look at your co-workers. Every culture is different, but dressing as casually or formally as your colleagues is generally a good practice. Tattoos: Tattoos are a common occurrence in most workplaces, and they rarely cost a job seeker a position. That said, it is wise to cover any tattoos that are large, distracting, or potentially offensive when at work or before an interview. Develop a “Work Uniform.” Once espoused by Steve Jobs and other tech leaders like Mark Zuckerberg, a new trend for the workplace is wearing the same thing every day, reportedly to free up brain power toward other topics. While this might seem stifling to some workers, developing a rotation of key items to wear to work could have benefits. Not only will you always look appropriate, but it will make your mornings much easier.